Pleading the Sixth: Oregon stands as a cautionary tale regarding indigent defense reform. Often extolled (including by this author) as a working model that provides effective public defense services through a statewide system of contracts, a new comprehensive evaluation by the 6AC reveals instead that Oregon constructed a complex bureaucracy that at root is simply a fixed fee system with high caseloads, limited supervision, and little accountability. Indeed, the state bureaucracy cannot even say which attorneys are handling which cases in which jurisdictions. Oregon may yet become a model indigent defense example to the rest of the country, but first it must abolish contracts that pit appointed lawyers’ financial self-interest against the due process rights of their clients. “Right now in our state, public defenders are being handed massive caseloads defending some of our most vulnerable populations, but are not being fairly compensated for that work,” stated Oregon House majority leader and chair of the House Judiciary Committee Jennifer Williamson, as first reported in the Willamette Weekly. 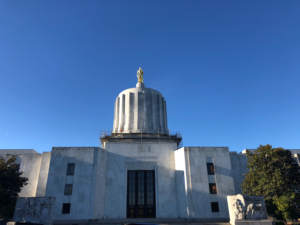 Rep. Williamson’s statement was issued after the Sixth Amendment Center briefed the legislature in late December 2018 on preliminary findings and recommendations from its statewide evaluation of Oregon’s public defense services. 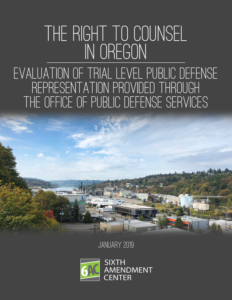 The 6AC report, The Right to Counsel in Oregon, released January 23, 2019, concludes that the State of Oregon has created a complex bureaucracy that collects a significant amount of indigent defense data yet does not provide sufficient oversight or financial accountability to ensure the provision of effective assistance of counsel as required by the Sixth Amendment. The report was prepared for the Oregon Public Defense Services Commission, the state agency responsible for establishing and maintaining the public defense system for Oregon’s entire state courts system. In some instances, the complex bureaucracy is itself a hindrance to effective assistance of counsel. Moreover, that complex bureaucracy obscures an attorney compensation plan that is at root a fixed fee contract system that pits appointed lawyers’ financial self-interest against the due process rights of their clients. The seven-member Public Defense Services Commission (PDSC) is a state agency in the judicial branch of Oregon’s government. The Chief Justice of the Oregon Supreme Court, who also serves as a nonvoting, ex officio member, has complete control over the membership of the PDSC, when each member is appointed, and when each member is removed. The PDSC oversees the Office of Public Defense Services (OPDS). Together, PDSC and OPDS are responsible for establishing and maintaining the public defense system statewide for cases that arise in all of the state courts. In addition, PDSC is required by state law to “adopt policies, procedures, standards and guidelines” addressing various aspects of providing the right to counsel. Meanwhile, PDSC and OPDS lack any responsibility for or authority over the provision of the right to counsel in Oregon’s justice courts and municipal courts, where counties and cities are left with the unsupervised responsibility to provide counsel to defendants who face the possibility of incarceration. Although PDSC/OPDS have state employed attorneys for some appellate services, PDSC/OPDS attempt to fulfill the State of Oregon’s Fourteenth Amendment obligations to provide effective Sixth Amendment right to counsel services in the state’s trial courts primarily through an array of contracts with public defender offices, private law firms, consortia of individual attorneys and law firms, non-profit organizations, and occasionally individual lawyers. In doing so, Oregon has created a complex bureaucracy that collects a significant amount of indigent defense data, yet it does not provide sufficient oversight or financial accountability to ensure the provision of effective assistance of counsel. All PDSC/OPDS contracts are either with an individual to be available for case-by-case appointments only in capital murder cases or with a contractor to receive a potential annual caseload of appointments across a variety of trial-level cases. A given contractor may be one attorney, but in most instances a particular contractor is made up of multiple individual attorneys. Altogether statewide there are approximately 647 individual attorneys who are participants in one or more annual and/or case-by-case contracts with PDSC/OPDS to provide some sort of trial level representation during 2018 and 2019. We say “approximately,” because PDSC/OPDS’s contract system does not permit PDSC/OPDS to know the identities of the individual lawyers doing the work, as the attorneys who participate in the annual contracts change frequently. In fact, PDSC/OPDS lacks information about and the ability to oversee the public defense system(s) as actually implemented. This results in, among other things, PDSC/OPDS failing to carry out its fiduciary duty to be an effective steward of taxpayer dollars. PDSC/OPDS requires all potential public defense providers to submit lengthy and detailed proposals for contracts. For 2018 and 2019, PDSC/OPDS has annual contracts with 63 different contractors, each of which provides trial representation in one or more counties. The PDSC/OPDS contracts have extensive financial reporting requirements and say that the contractor groups and the attorneys within them must abide by the PDSC Qualification Standards for Court-Appointed Counsel and by the Oregon State Bar’s Performance Standards for Criminal and Delinquency Cases. The State of Oregon lacks any mechanism, however, to know whether contractors and the individual attorneys within them actually comply with these standards. Moreover, the contracts let to consortia expressly allow them to enter into side agreements and subcontracts, without notice to or oversight by PDSC/OPDS. Furthermore, PDSC/OPDS does not require any of the contractors to explain the manner in which the contractor assigns cases to its constituent individual attorneys. In short, PDSC/OPDS devolve onto their contractors the state’s responsibilities under the Fourteenth Amendment, including the selection of the individual attorneys who provide the right to counsel, how those individual attorneys are appointed to the cases of specific defendants, and how and how much the individual attorneys are paid for their work. The complex PDSC/OPDS bureaucracy hides a stunning lack of oversight. That is, PDSC/OPDS do not have any way of knowing who the attorneys are or how many attorneys are providing right to counsel services on any given day, and the State of Oregon cannot ensure the lawyers appointed in each case are actually qualified to handle effectively the cases to which they are assigned. PDSC/OPDS do not require the contracting entities to explain how much money is spent on overhead and what is acquired, how much money is paid to a contract administrator and what services are provided in exchange, or how much money is paid to the constituent individual attorneys and what services those attorneys provide in exchange. Oregon’s complex bureaucracy obscures an attorney compensation plan that is at root a fixed fee contract system that pits appointed lawyers’ financial self-interest against the due process rights of their clients. The Right to Counsel in Oregon explains in great detail the complex “case credit” system devised by PDSC/OPDS for compensating an array of contracting entities for the representation provided. In basic terms, Oregon’s contract public defense providers earn “credits” for the defendants they represent. For example, all of the contractors in one Oregon county earn a flat $913 for each class B felony credit they handle, out of which they must pay for all overhead costs before earning any compensation for the attorney who represents the defendant. The “case credits” system ultimately pays most contractors a fixed fee per case without regard to how much or how little time the case requires of the attorney. Most contractors must report the credits they earn each month to PDSC/OPDS. But, when all is said and done, that reporting system does not allow PDSC/OPDS to know the actual number of cases being handled by every attorney at any point in time. Thus, PDSC/OPDS has no means of knowing on an ongoing basis whether its contract providers have sufficient attorneys with sufficient time and resources to provide effective assistance of counsel. Importantly, PDSC/OPDS have enacted no workload controls, and there is no maximum nor minimum number of credits that each attorney within a contractor can earn across the contract period. This compensation plan creates an incentive for most attorneys to handle as many cases as possible and to do so as quickly as possible, rather than focusing on their ethical duty of achieving the client’s case-related goals. Not surprisingly, examples of excessive caseloads abound throughout the state. In addition, in a compensation structure that emphasizes “case credits” over effectiveness, contract providers lack resources to ensure appropriate training and supervision of their individual attorneys. The 6AC recommends that the State of Oregon abolish fixed fee contracting (and the excessively low $46 hourly rate paid to individual attorneys outside of the contract system) that produces disincentives for public defense lawyers to provide effective assistance of counsel. Oregon should either pay private lawyers at an hourly rate that accounts for both actual overhead and a reasonable fee or hire adequately compensated and resourced government-employed public defenders for trial-level services. In order for PDSC to effectively exercise its authority, it is imperative that the statutory language be amended to ensure that the commission’s members are appointed by diverse authorities so that all branches of government are involved in and responsible for the effective provision of the Sixth Amendment right to counsel.